Ok some update from the Singapore trip. So what's new in Lion City you might ask.. well.. if you're at the Esplanade or Suntec City vicinity, its hard to miss a towering ferris wheel in between the building. They call it the Singapore Flyer. Actually, I've seen it during my previous trips to Singapore however it is still in construction. This time round though; me, Aiza, Tini & Fariz got the chance to get on board this new landmark. We were amongst the earliest to get on as it only commence its service a week earlier on 1st March 2008. Even the taxi driver had to guess where exactly the Singapore Flyer is located on the road. We bought our tickets online via Singapore Flyer website. Normal tickects without express boarding costs SG$29.50 each or approximately RM 68.00. Express boarding is where you can skip waiting inline and board direct into the capsule. However, I think the extra SG$20 for that isn't necessary if you are going during off-peaks; morning, office hours etc. We went on Saturday morning, there weren't many people and no queue. As you get closer to the ferris wheel, you begin to awe over the scale and its engineering feats. Man!! this thing is really huge when you're up close to its base. 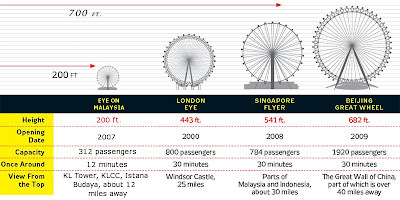 The Flyer stand tall at 541 ft, currently the highest in the world till completion of Beijing Great Wheel in 2009. To assist you in imagining the height, just look at the KLCC skybridge; its only a few feet shy from that. Its very tall isn't it? On board, the capsule is spacious and comfortable (for those whom are not afraid of heights a presume). The view is magnificent when you higher on the altitude. On the South East bearing, you can see the wide open space of the ocean with lots of ships. 180 degrees back to North West, you can see Singapore's concrete jungle of skyscrapers. The ride will take on for 30 minutes, whereby you will have ample time to enjoy the scenery and take as much photos as you wish. you know what the singapore flyer reminds me of? Bên anh biết cong ty van tai hang hoa nào có gia cuoc van chuyen bang duong bo rẻ không, anh cần tìm đơn vị để chuyển hàng gian phoi quan ao. Bên tớ chuyên cung cấp các loại giàn phơi quần áo thông minh Hoà Phát, mau gian phoi quan ao Duy Loi, giàn phơi quần áo Sankaku, giàn phơi đồ thông minh tại Hà Nội, phu kien gian phoi thong minh, giàn phơi quần áo Seri 9999, giàn phơi quần áo KG 900 Gold, gian phoi thong minh KS950, mẫu giàn phơi quần áo SERI 999B, gian phoi thong minh Sankaku S01, giàn phơi thông minh Seri 888. Ngoài ra bên mình cũng cung cấp lap dat thang toi hang, bao gia thang may gia dinh.